We have reviewed several mounts for the Mac mini over the last two years, and without a doubt, the [url=http://www.cinnamon-peripherals.ca/products/cinnamount-mini/]CinnaMount mini[/url] by Cinnamon Peripherals is the best of the bunch. 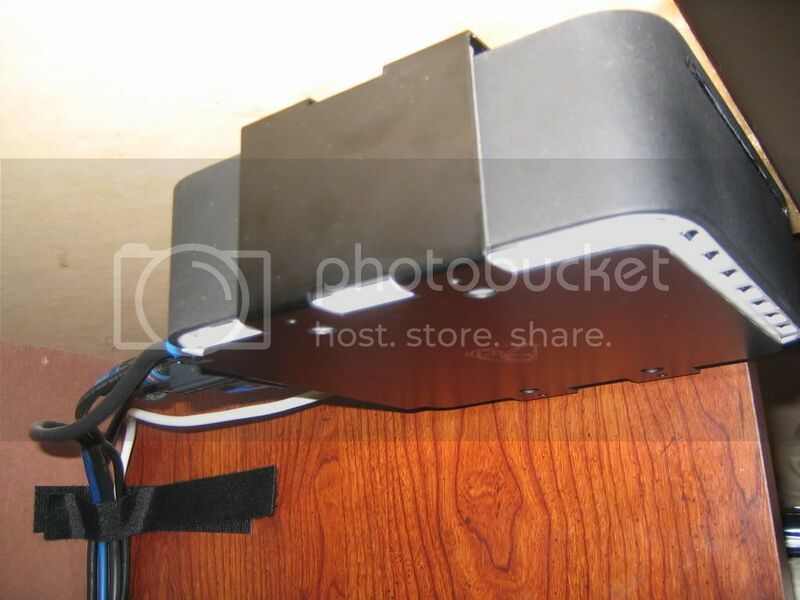 This versatile mount allows you to mount your Mac mini under a desk, shelf or on a wall. It can also be stacked or mounted side-by-side with additional CinnaMount minis for mounting external devices like the NewerTech miniStack V2 or Apple's new 802.11n Airport Extreme base station alongside your Mac mini. Our CinnaMount mini came packaged neatly in a small white box. Included in the box was the mount itself, four 5/8" screws with white plastic caps for securing the mount, four #6-32 3/16" bolts for attaching an additional mount, an Allen wrench, three Velcro strips for cable management, a drilling template and the instruction manual. Our kit also came with an optional mount for the Mac mini's power supply. The instruction manual that comes with the kit is well written and provides all the information needed to install the CinnaMount mini. To install the mount, you will need a hammer, nail, Phillips #2 screwdriver and a drill with 3/32" bit. It should also be noted that your mounting surface needs to be at least 5/8" thick. We were able to install our CinnaMount mini underneath a desk in roughly an hour. This included attaching a second mount below with the #6-32 3/16" bolts and Allen wrench supplied in the kit. The CinnaMount mini itself is made out of a single piece of 0.051" thick anodized aluminum. This allows the mount to be both sturdy and lightweight. The anodized aluminum also matches the coloring of the Mac mini perfectly. The dimensions of the mount are 6 13/16" wide x 6 5/32" deep x 2 3/8" tall, but the actual sides of the mount are only 3" deep. They are unobtrusive and allow for easier access to the back of the Mac mini. 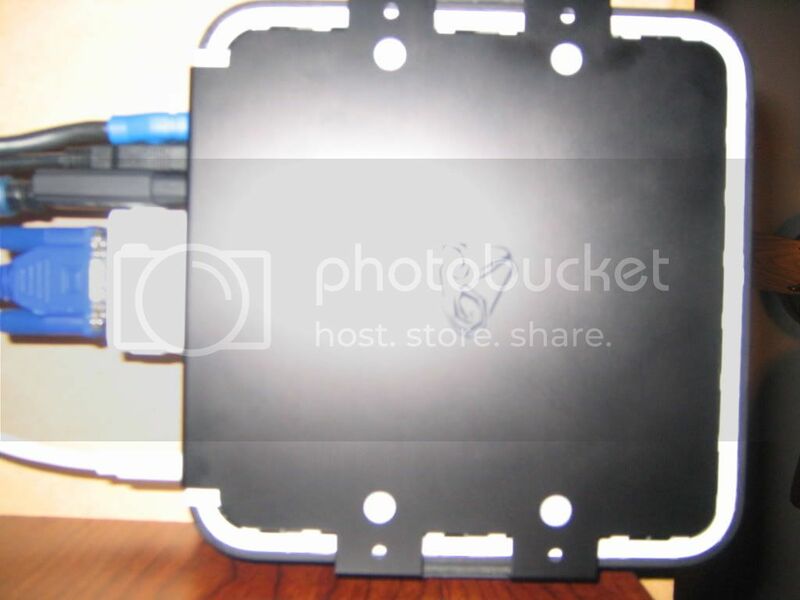 The sides are also lined with foam pads that will protect and hold your Mac mini snuggly in place. The bottom of the CinnaMount mini follows the contours of the Mac mini's bottom vents to allow for maximum airflow. 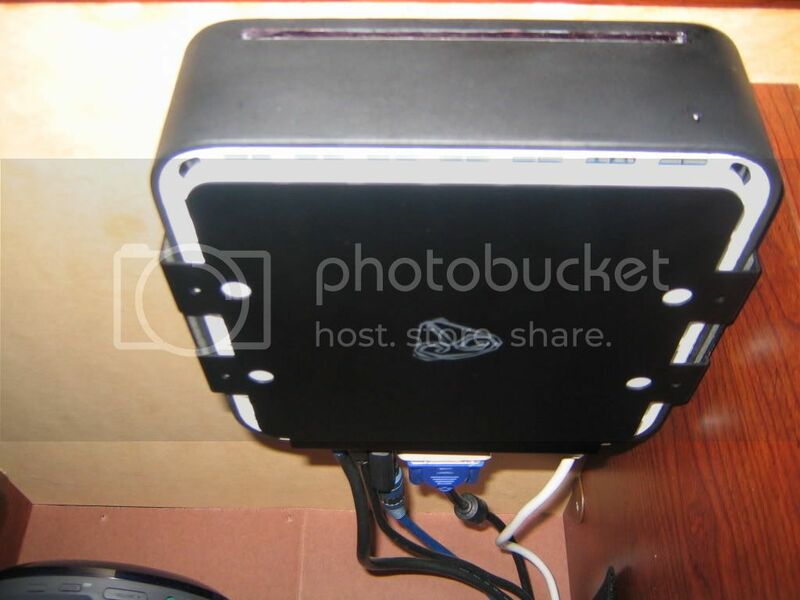 Our Mac mini ran at normal operating temperatures while sitting inside the mount. The bottom of the mount also features a raised lip on the back to prevent the Mac mini from sliding or falling out of the mount. This lip also prevents the Mac mini from falling out of the CinnaMount mini when it's mounted on a wall. As we have mentioned, the CinnaMount mini can be stacked so that your external hard drives and other devices can be mounted alongside your Mac mini. You can stack up to three mounts vertically. If you don't have enough room to stack them vertically, the design of the CinnaMount mini also allows you to mount them side-by-side. 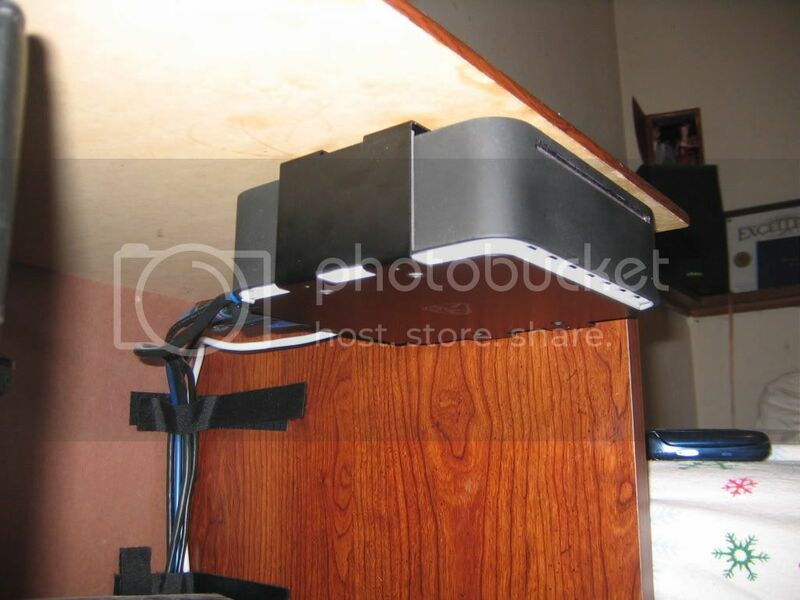 This method of mounting might actually work out better in an entertainment center or where space is limited. We tested two CinnaMount minis stacked vertically with four of the most popular Mac mini-style external hard drives on the market. This included the LaCie mini Hard Drive & Hub, NewerTech miniStack V2, MicroNet miniMate and the WiebeTech Maxelerate. They all fit nicely into the mount. The shorter sides of the mount that we talked about before also allow for complete access to the side USB and FireWire ports on the LaCie mini Hard Drive & Hub and NewerTech miniStack V2. We would also like to mention that the added space (approximately 3/4") between your Mac mini and the external hard drive in the second mount will prevent heat from being transferred between the two devices. Overall, we can recommend this product to our readers and give it a score of 4 out of 4 stars. The CinnaMount mini is shipping now, and has a suggested retail price of $30.20 ($34.50 with the optional power supply mount). Cinnamon Peripherals also offers the CinnaMount mini in black anodized aluminum at the same price. The prices listed above are approximations in $US, the exact prices are $35 CAD for the CinnaMount mini, $40 CAD for the CinnaMount mini + power supply mount. Also, please note that the CinnaMount mini Black Limited Edition is currently unavailable since most of our black units have visual/aesthetical defects and must be checked one by one. A small number of black units should be available later this week. If anyone has any question, please feel free to ask. P.S. : coming soon, the CinnaMount TV for the Apple TV! OOOOh, me likes the black Mini!! I like the looks of your black mount and actual mini. I've never seen your setup before, can you post your whole setup sometime? [quote="TyPod"]I like the looks of your black mount and actual mini. I've never seen your setup before, can you post your whole setup sometime? [/quote]That is pretty much about it. It is mounted to a printer desk that I got for free. It is really small and sits right next to my bed. A Samsung monitor sits on top, all the cables routed in the back, with the power bricks and external hard drive placed underneath. They all sit in a divided area under a large drawer. There is a little fan and space for the hard drive area to vent, plus the power bricks are in an adjacent space. It is nothing elaborate. Something simple that doesn't take too much space in my bedroom. It is my personal machine, while the house machine is a G5 iMac in the dinning room. I never posted pictures of it, because it is nothing special. Really simple, plain and small. I understand. It seems pretty cool to me, I like how all your computer equipment is "hidden". I'm thinking on getting a silver one. Just in case I revert back to a original top housing. But the black one has served me well. Since it is mostly hidden underneath, it collects less dust. I don't have to dust my Mini every other week like I used to. Now it is only every other month. There hasn't been any problems with AirPort/Bluetooth reception. 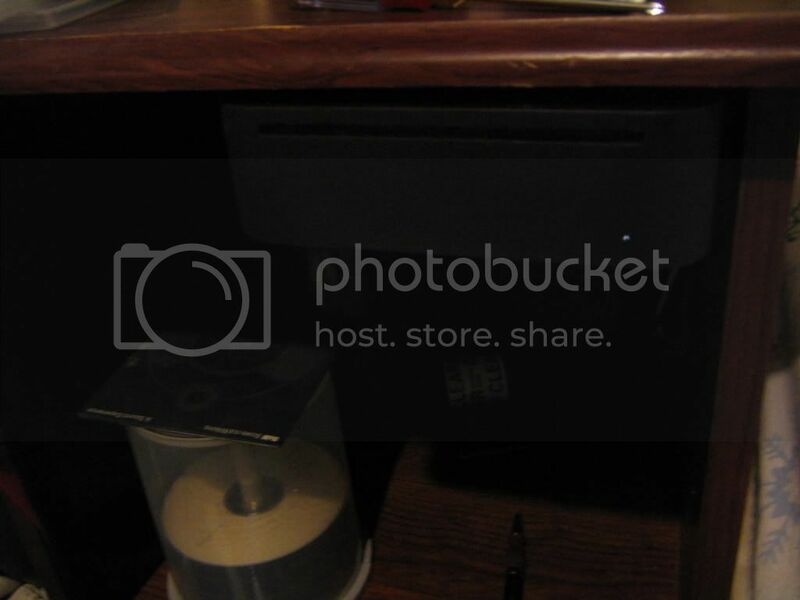 And it frees up the area below, so I can store my DVD-R/CD-Rs and other things. The CinnaMount mini does not block the bottom vents at all except for two 1" strips on each side. The bottom of the mount follows exactly the actual contours of the bottom of the Mac mini (the rubber part), not the contours of the sides. The back bottom of the Mac mini doesn't have any vents, so no problems there. I would like to get two of these when the C2D Mac minis come out. I have a question though. Would there be enough room in the second mount for a drive like the [url=http://www.transintl.com/store/category.cfm?category=2621]miniD[/url] (which is the same as the miniStack) and the [url=http://catalog.belkin.com/IWCatProductPage.process?&Product_Id=199956#]Belkin Mac mini hub[/url] to be stacked together? I'm thinking it would be close based on the dimensions. The miniD and Belkin Mac mini hub stacked together are taller than a Mac mini and will not fit in a single CinnaMount mini. The only Mac mini-sized peripherals that I know of that could be stacked and still fit in a CinnaMount mini would be those thin hubs and KVMs (except the Princeton PKV-02MM which is almost as tall as a Mac mini). Thanks for letting me know. The two stacked aren't that much higher than the Mac mini. I thought it might be close. It is, in fact, pretty close. However, the CinnaMount mini was designed to allow vertical installations too, so the height is set so the mount can hold the Mac mini vertically along with the back tab. This mount barely does that. I hardly notice any heat coming out from the bottom vents on the mini. I think the vent you don't want to block is the vent in the rear, on my mini it seems to give off a little more heat than any other vent.